Number of DEAD IN SERVICE unknown. The Seven Years' War (1756-1763) is a major conflict, the first to qualify as a "world war". It consistently mixes the great powers of the time, grouped into two sets of antagonistic alliances, and runs simultaneously on several continents and theaters of operations, including Europe, North America and India. It mainly opposes the kingdom of France, the archduchy of Austria, their colonial empires and their allies, the kingdom of Great Britain, the kingdom of Prussia, their colonial empires and their allies. However, through alliances and opportunism, many European countries and their colonies participate in this war, including the Russian Empire alongside Austria and the Kingdom of Spain alongside France. The conflict has resulted in a significant rebalancing of the European powers. In North America and India, the British Empire wins. It makes almost completely disappear the first French colonial space. In Europe, it is Prussia which asserts itself in the Germanic space by the victories of Rossbach on the French and of Leuthen on the Austrians (1757): it contests henceforth the preeminence of Austria. The beginning of the war is generally dated August 29, 1756, the day of the attack of Saxony by Frederick II of Prussia, who thus makes the choice to forestall the aggression programmed by Austria to take possession of Silesia. However, the clash began earlier in the North American colonies. In Canada, this part of the conflict is called the Conquest War, while in the United States it is called the French and Indian War. In 1754, France had a vast crescent-shaped empire stretching from the Canada and Great Lakes region to the shores of the Gulf of Mexico. She had managed to ally herself with the many powerful Algonquin, Huron and Montagnais tribes that helped her in her establishment, with the notable exception of the Iroquois who remained mostly loyal allies of the British. 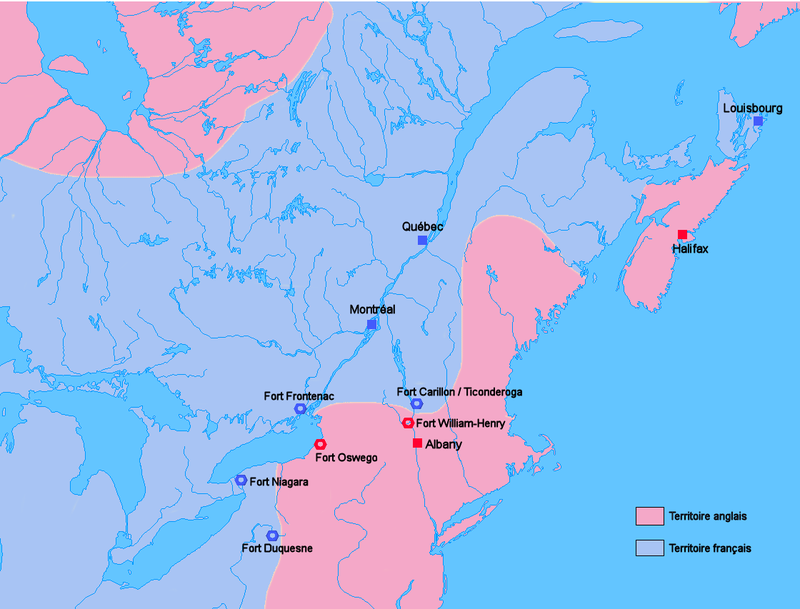 A string of forts and posts united Canada with the possessions of the south encircling the thirteen British colonies on the Atlantic coast. British possessions were therefore isolated east of the Appalachians and American settlers could not move west. 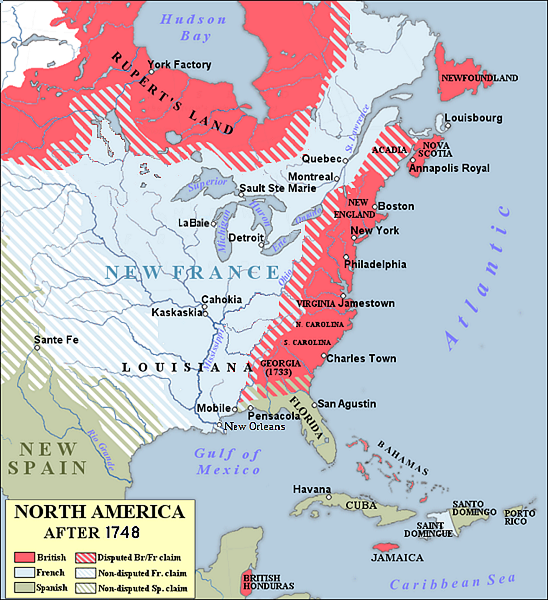 The North American side of the conflict pitted Great Britain and its American colonies against the French and their Native American allies. This included a struggle to dominate the most interesting territories for trapping beavers, hares, lynx, wolves whose furs were at the time a source of significant commercial benefits (the resource being exhausted in Europe as a result of overexploitation). 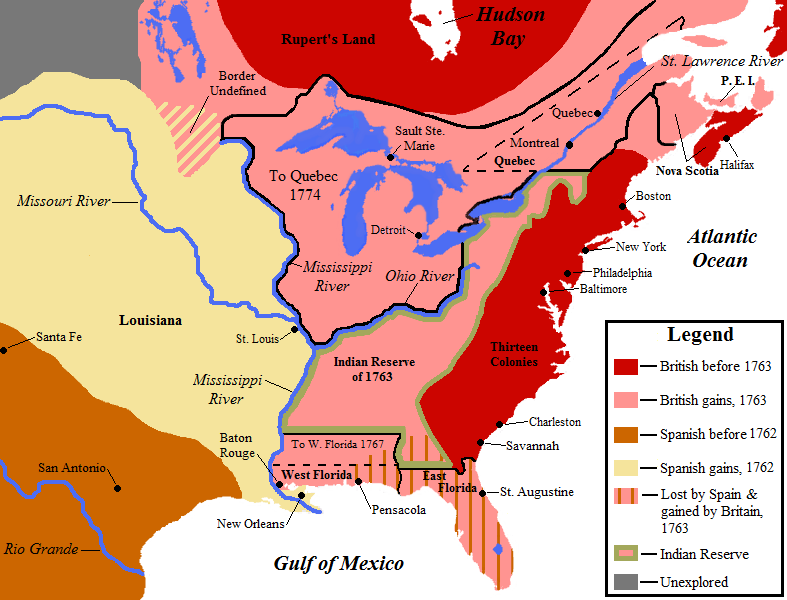 For the Americans, this war is not called "Seven Years War" but "French and Indian War", indicating that it also concerns the Amerindians, even if it is above all a conflict between European colonial powers. In the West Indies, the French have a certain number of islands which are of great economic importance because they supply a lot of sugar, spices and vanilla; the British also own islands, but the main (declining) power in the region is Spain. 4.The fishing area off Newfoundland is full of fish and the fishing rights are disputed by both. 5.The most crucial point is undoubtedly the control of the Ohio Valley. This territory is coveted by the British, the French but also the Iroquois. The French base their claim on the treaty of Utrecht of 1713: this treaty stipulates that the Iroquois are not subjects of the British crown. Since Ohio is considered land that the Iroquois have conquered over the Shawnees since 1742, the British consider themselves the rightful owners. But, concretely, this area, which was fortified by the Governor Duquesne, is under the control of the French thanks to the presence of several forts. Facing the Iroquois Confederacy (Onondaga, Oneida, Seneca, Tuscarora, Mohawk, and Cayuga) and some involvement of the Catawba and Cherokee, and the 45,000 British soldiers; the French only lined 10,000 soldiers - a few militiamen but mostly many Amerindian allies, including mainly Abenaki - Algonquins - Huron-Wendat - Maliseet - Montagnais - Micmacs - Outaouais - Lenapes - Ojibwe - Shawnees - Potawatomis. The Chevalier de Lévis, who commands the French troops since the death of Montcalm, is organizing an offensive on Quebec. Thanks to the victory he won at the battle of Sainte-Foy (April 29, 1760), hope was reborn in the French camp; but the British offensive on Montreal and the presence of the British fleet in the St. Lawrence forced French forces to retreat. The capitulation of Montreal was signed by Governor General Pierre de Rigaud de Vaudreuil and Major General Jeffrey Amherst, on behalf of the French and British Crowns, on September 8, 1760. But the war is not over, especially in Newfoundland, with the Battle of Signal Hill, September 15, 1762 which ended in a British victory, which will cause the fall of the city of Saint John three days more late (which the French had seized in 1762). 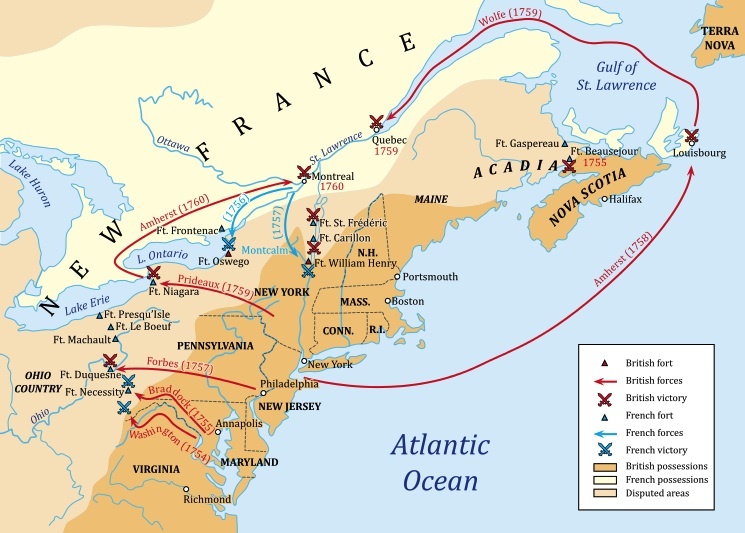 By the treaty of Paris signed in 1763 between France and Great Britain, it obtains from France the Île Royale, Isle Saint-Jean, the North of Acadia, Quebec, the Great Basin Lakes, as well as all French territories located east of Mississippi. But France also finds territories in America, like its Caribbean territories, as well as Saint-Pierre-and-Miquelon (which it had lost in 1713).